George Gurdjieff was born in 18771 in Alexandropol, Russia, to parents of Greek origin. His father, an illiterate herdsman, inherited the oral tradition of an ancient culture and imprinted Gurdjieff’s childhood with poems and myths of a distant past. Gurdjieff writes with great respect and admiration of this period and its formative influence on his later life. Along with his father, he considered his first teacher to have been a certain Bors priest, and attributes to the joint influence of these two mentors his unique ability to cope with challenge. Gurdjieff received an unusual combination of a modern scientific education with a traditional religious one. The daily encounter in his childhood with people of various spiritual dispositions brought him in direct contact with the mysteries of life. Between 1887 and 1907, he formed a group called Seekers of Truth and carried out numerous expeditions to the Middle East, India, Central Asia, and Tibet, in search of knowledge. They worked under the premise that there had existed ancient knowledge explaining the meaning of life and the fulfillment of man’s potential, that had been lost. The Seekers of Truth eventually managed to gather and synthesize scattered fragments of an ancient teaching. Gurdjieff provides an account of this period in his autobiographical novel Meetings with Remarkable Men, from which director Peter Brook derives the film of the same title. However, the story may not be entirely literal, and J. G. Bennett, a pupil of Gurdjieff’s, suggests that various figures in it are symbolic. Nevertheless, that Gurdjieff spent his early years in methodical search, and that he indeed gained access to secret monasteries, is undeniable. In 1907 in Tashkent, Gurdjieff started teaching supernatural science. In 1912, he formed a first working group in Moscow, and in 1913, another in St. Petersburg. There he met Peter Ouspensky who would become the chief literary disseminator of his teaching. The first world war followed by the Russian revolution pushed Gurdjieff to repeatedly relocate, losing each time the foundation he built for organized group work. After a brief stay in Dresden, Germany, he established his work at the Prieure of Avon near Fontainebleau, France. There he began attracting more students, especially British and American. He gradually attracted writers, painters, mathematicians, philosophers, architects, musicians, and all kinds of individuals seeking inner truth. With these members Gurdjieff could develop an independent community with an array of daily obligations geared to intensify self-observation and self-knowledge. The Movements or Sacred Dances were Gurdjieff’s specialty. From 1924 onward, he organized tours around the United States in which his pupils performed these dances publicly. As interest in his teaching developed, he founded groups in the United States led by Alfred Richard Orage. In the same year, however, he had a major car accident that nearly cost him his life. A long and painful convalescence followed. This incident changed the direction of his work. Gurdjieff gradually shifted his efforts away from the Prieuré and eventually lost it due to economic difficulties in 1933. However, he continued teaching his ideas and techniques in Paris, and continued making frequent trips to the United States. His declining health brought him to realize that he would not have enough time to bring his group to a level in which it could continue without him. Therefore, he shifted his focus to creating a written body of knowledge that would perpetuate his teaching after his death. During the years to come, he labored incessantly on his magnum opus, Beelzebub’s Tales to his Grandson, using his students’ help to formulate, encrypt, and translate this unusual message. In 1948, his health worsened till he died in on 29 October 1949 in Neuilly, France, after conveying his final instructions on the continuation of his work to Jeanne de Salzmann. De Salzmann would organize and develop what is still known today under the name of The Gurdjieff Foundation. Within the ranks of his Seekers of Truth, Gurdjieff claimed to have discovered lost ancient knowledge. He claimed to have obtained this knowledge first hand by patient request, by cunning guile, and in some cases even by blatant theft. Today such claims could have easily been verified or refuted, but in Russia of the early 1900’s those who wished to obtain his knowledge had to give him the benefit of the doubt. Impressed by his presentations, early followers quickly realized that he had indeed possessed a unique and comprehensive teaching. At the same time, the overall picture still seemed under construction; Gurdjieff seemed to be laboring to bring its many facets into a coherent whole, at some times more and at other times less successfully. 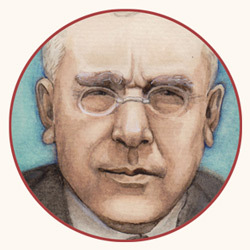 Accordingly, Peter Ouspensky, who authored the most significant documentation of Gurdjieff’s early lectures, titled his book Fragments of an Unknown Teaching2. 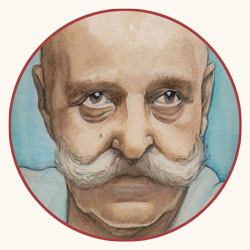 When forced by his students to provide the traditional name of his teaching, Gurdjieff reluctantly confirmed it to be Esoteric Christianity. Nevertheless, several ideas were clearly influenced by other ancient sources such as Sufism, Hinduism and Buddhism. J.G. Bennett even argues that the main character in Beelzebub’s Tales embodies Zoroaster, founder of Zoroastrianism. In this respect, Gurdjieff’s early teaching is an effort to synthesize and re-express a wide array of ancient knowledge in contemporary times, to bring them into the industrial age by translating their terminology into ‘machines,’ ‘forces,’ ‘influences,’ ‘hydrogens,’ etc. This effort is more evident at the beginning of his teaching than later on. At some point, Gurdjieff seems to abandon the need of translating the old into the new altogether and reverts to a more allegorical exposition. Beelzebub’s Tales to his Grandson epitomizes this transition, although the book’s posthumous impact ended up falling short from its author’s prediction. “I often regretted having begun too late to give the legends of antiquity the immense significance that I now understand they really have,” says Gurdjieff says in an autobiographical preface to Meetings with Remarkable Men. In BePeriod we seek to remedy this regret. If his realization of the significance of ancient legends came too late, it is only natural that we build on his efforts by giving ancient legends proper prominence. Accordingly, our teaching draws from three myths that stand at the foundation of Gurdjieff’s early presentation: 1. 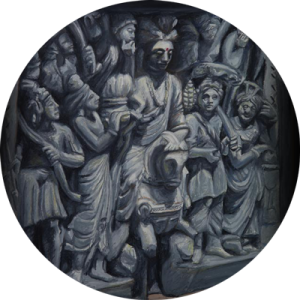 The urgency of man’s condition drawn from the Buddhist story of Prince Siddhartha; 2. Self knowledge, the law of seven, and deviation drawn from the Judeo-Christian creation myth; and 3. Developing unity from multiplicity drawn from the Hindu myth of the Churning of the Milky Ocean. The evolution of man’s consciousness thus begins with his realization of his true condition: that he is asleep, that he is a multiplicity of thoughts, emotions, and physical impulses, and that these function in utter chaos. Gurdjieff’s psychological descriptions were probably influenced by a branch of Esoteric Christianity called the Philokalia. His Law of Three is likely derived from the Christian Doctrine of the Trinity, although the same principles also appear in Hinduism in the triad of Shiva, Vishnu, and Brahma. The most ancient philosophers claimed that man mirrored the world in which he lived. “As above so below and as without so within”3 was inscribed on the Egyptian Hermetic tablets. 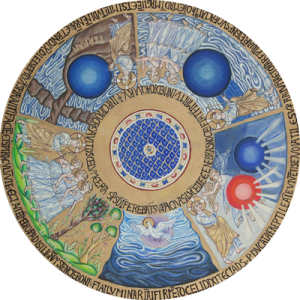 By this token, creation myths — that obviously come short of providing convincing evidence for how the physical universe came into being — are metaphors of introducing order into the chaos of any cosmos, including the micro-cosmos man. The process is gradual and each step is specified. As in any sequence that progresses through time, deviation is inevitable. After realizing his true condition, man will naturally seek to learn how to awaken, to gravitate from multiplicity toward unity, to establish order in his psychological chaos. Accordingly, the Genesis creation myth begins with chaotic darkness and ends with orderly light. To draw a practical meaning from this story, the significance of each participant must be understood. What is God in the micro-cosmos man? What is heaven, earth, and oceans beneath the earth? What are plants, birds of the air, beasts of the field, and fish of the sea? And most importantly, how do these symbolic participants behave when there is order, and how do they behave when there is chaos? The Genesis myth also sets the stage for portraying how man loses consciousness. Since each of man’s thoughts, emotions, and physical impulses readily assume the word ‘I’ and speak for the whole, Gurdjieff calls them the many ‘I’s. The Genesis myth suggests that there is a subtle mind behind these ‘I’s, that uses them to keep man asleep by intention. The serpent thus tricks Adam and Eve into biting on one of these ‘I’s, and in turn, into losing consciousness. As long as man is unfamiliar with his multiplicity — as long as he does not know himself — his many ‘I’s keep deviating4 from consciousness. According to George Gurdjieff, if a permanent principle were to be developed in man, the consequences would be far reaching. Man would access exceptional powers and gain objective knowledge about himself and the world around him. By virtue of having a single and permanent ‘I’, he would become free from the chaotic forces of his environment, and in this respect, would escape from its prison. “If there is anything in a man able to resist external influences,” says Gurdjieff, “then this very thing itself may also be able to resist the death of the physical body.” Man’s permanent ‘I’ would gain the attribute of immortality. The struggle between ‘yes’ and ‘no’ in man is embodied in the Hindu myth of the Churning of the Milky Ocean. During an era in which the Hindu universe is threatened with chaos — in which the forces of evil dangerously outnumber the good — Vishnu the preserver god is petitioned by the earth to help restore equilibrium. The only way to recover the elements that contribute to order is to retrieve them from the ocean of milk through churning. To accomplish this grand endeavor, gods and demons must collaborate by winding the giant serpent Vasuki around Mount Mandara and using the two as rope and rod by which to churn the ocean. Churning produces friction. Friction enacts transformation. Churned milk becomes butter and churned wood combusts. To transform from a multiplicity of ‘I’s into a single and permanent ‘I’, man must enact the same principle within, by repeatedly pulling against his many ‘I’s. Moreover, the Hindu myth not only portrays the principles required for attaining unity, it also portrays their pitfalls. “Crystallization is possible on a right foundation and it is possible on a wrong foundation,” says Gurdjieff. Indeed, at first, the Hindu churning is enacted with no foundation at all. Mount Mandara quickly collapses into the ocean resulting in casualties on both sides of the churning rope. 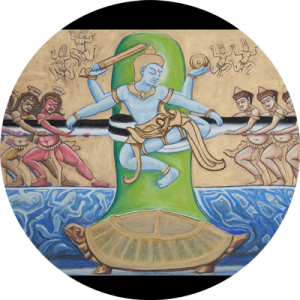 Vishnu then incarnates in the form of a giant turtle and upholds the mountain on his back. Thus properly supported, the churning proceeds and order in the cosmos is eventually restored. As in the previous myths, to glean a practical lesson from the Churning of the Milky Ocean, the significance of each of its members must be properly understood. What is Vishnu? What are gods and demons? How does one enact an inner struggle between ‘yes’ and ‘no’? And most importantly, what is the right foundation for that struggle? It would be unfair to leave the reader with the impression that Gurdjieff left a blemishless reputation in the history records. His methods were controversial. His behavior was contentious. His conduct was destructive, at times even self-destructive. Throughout his career, he seems to have deliberately made it impossible for his students to continue following him. In some cases, he also took care to make it as difficult as possible for them to continue working on their own. A century later, whether this madness had a method to it is difficult ascertain. But to disqualify his teaching on this account is to throw out the baby with the bathwater. Doubtlessly, Gurdjieff’s knowledge and methods shaped esotericism of the twentieth and twenty-first centuries. Doubtlessly, his pioneering efforts to excavate ancient knowledge and graft it onto the modern age made BePeriod possible. Therefore, whatever good BePeriod has done for its participants, due credit must be given to George Ivanovich Gurdjieff. 4. For this reason, ‘Devil’ and ‘Deviation’ share the same root.